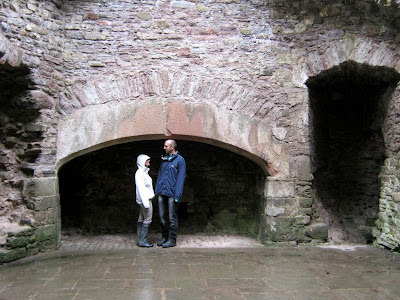 Relatively Retiring: A Weekend In Wales. Fine, drifting, misty rain that obscures the hills and swirls gently down the valleys. We can't see very far ahead, but there is always a castle to visit. Where ever you are in Wales, there will be a castle towering into the mist, crumbling into the damp grey earth. The past is always right beside you in Wales. In this particular castle, which happens to be Raglan, my son and daughter-in-law take refuge on the hearth of a massive, dripping kitchen chimney, where they dance about a bit to keep warm. Then we go down into the undercroft, where there is a roof and a bit of dryness. Later, back at the cottage, the little garden is green and dripping, and then suddenly diamond-spangled as the sun comes out. The only sounds are the irregular thumps of small hard pears, falling from an ancient tree, the croaking of crows, and the mewing buzzards floating high. A light breeze bowls along the lane, lifting leaves, and a cascade of pears thuds to the ground. The outdoor tables and chairs are crunchy with thick grey lichen, and a few autumnal wild-flowers, mallow, coltsfoot, cranesbill and herb robert sprawl in the long wet grass. 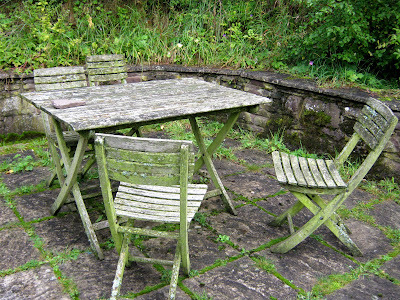 The grey stone walls are mossed with fat green cushions. A distant engine; a two-tier trailer of sheep arrives and is clankingly opened, metal ramps lowered. The sheep hesitate, poised between freedom and security. Then one steps out, and a clattering flurry pours down into the little muddy lane. Down the valley, over the stream, into the field. The dog circles, eyes fixed on the slow, the wayward, the hesitant. In the west the heavy grey clouds come to a slow rolling boil again, and the sun shines white through a haze of mist. The crows fly away to the east, shouting raucously to one another as they go, and in the trees behind me a squirrel natters and shrieks at a threat that only he can see. Green and grey, damp, dripping and spangled, unpredictable and timelessly lovely. This was a weekend in Wales. Sounds perfect! What is a bit of rain and mud when everything else is so magical? Glad you had a good weekend and that pottery looks beautiful. A tour in blue rain. 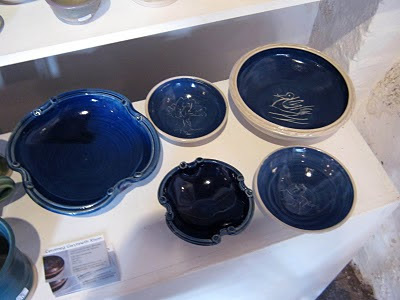 That pottery is exactly the blue I most love. Is that gz's? Marigold J and Zhoen: magical is the right word for Wales. Yes, the pottery is by gz, and the link to her is at the end of my post but is faint in colour. Her work is really beautiful. Did you see the pear tree at the gallery? I was there: I felt the soft rain, saw the old, fallen castles settling back into the ground, heard the cries of old victories and.. Thank you for this, RR. GZ: Yes, I did try, and thought your work is beautiful. Hope the perry turns out well. Frances: I'm so glad you liked that, and didn't get as wet as we did. Lovely descriptions - thanks for the little vicarious holiday this morning! Those bowls are gorgeous. I loved Wales (the north) when I visited (a few years ago now). The drizzly rain seemed simply part of the landscape; something to appreciate rather than rail against. Curiously, the region of southern Ecuador through which I'm travelling has something of a similar feel — misty and beautiful. Propello Innovations Private Limited is the vision of young minds that puts together the innovations of modern technology to develop environment friendly and comfortable by offering useful and domestic appliances such as kitchen chimney, RO water purifiers, Cook Top, Hobs etc.